Two outer cylinders, threaded ported sleeve, eyelets, bushing, baffle, spirals, encapsulator, front end cap. 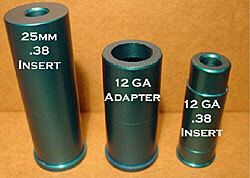 The internal components or the outer cylinders, are also silencers as defined. Any device for silencing or diminishing the report of any portable weapon.